The figure shows how geometrical music theory represents four-note chord-types -- the collections of notes form a tetrahedron, with the colors indicating the spacing between the individual notes in a sequence. In the blue spheres, the notes are clustered, in the warmer colors, they are farther apart. The red ball at the top of the pyramid is the diminished seventh chord, a popular 19th-century chord. Near it are all the most familiar chords of Western music. Credit: Dmitri Tymoczko, Princeton University. 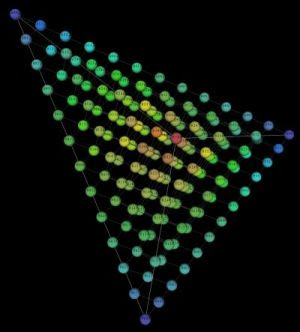 Well it seems the ancient Greeks were right about tying geometry to music as three music profs have connected sophisticated 3D modeling techniques to musical components to come up with a powerful new way to analyze music. "They take sequences of notes, like chords, rhythms and scales, and categorize them so they can be grouped into "families." They have found a way to assign mathematical structure to these families, so they can then be represented by points in complex geometrical spaces, much the way "x" and "y" coordinates, in the simpler system of high school algebra, correspond to points on a two-dimensional plane. " What they found was pretty amazing in terms of how easily "western" composition could be transformed into really interesting geometric shapes (including spheres), something that Thales and his student Pythagoras, used in developing number theory to describe how reality worked. "The (Pythagoreans were) ... the first to take up mathematics ... (and) thought its principles were the principles of all things. 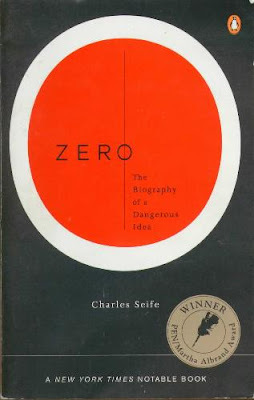 Since, of these principles, numbers ... are the first, ... in numbers they seemed to see many resemblances to things that exist ... more than [just] air, fire and earth and water, (but things such as) justice, soul, reason, opportunity ..."
What's also fascinating about the Greeks is the fact they hated the concept of Zero. "The Babylonians invented it, the Greeks banned it, the Hindus worshiped it, and the Church used it to fend off heretics. Now it threatens the foundations of modern physics. For centuries the power of zero savored of the demonic; once harnessed, it became the most important tool in mathematics. For zero, infinity's twin, is not like other numbers. It is both nothing and everything." Addendum: Check out Zeno’s Paradox to see what happens when Zero is left out of the equation.